Jesus Christ died for me, Ira Thomas. How precious indeed, I must be in His eyes that He would give His life in order to have me back! 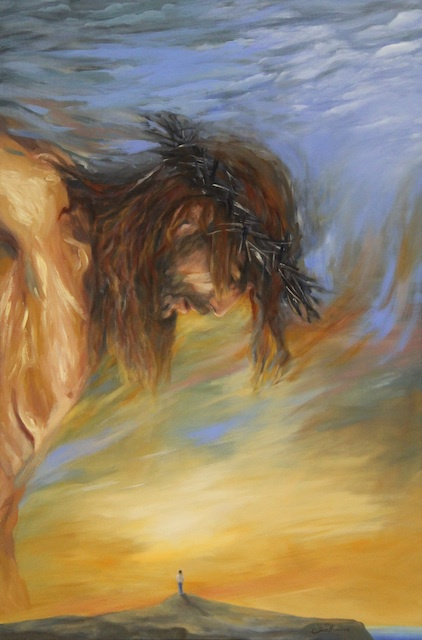 In this painting, I am recalling that moment of grace when it hits us, that small as we are, God loves us to this extreme; that He would give His Son for our ransom. There is no despicable person of lesser value to God. Jesus died for every single human from the grateful to the ungrateful, from the Christian to those who never heard of Christ, from the tyrannical dictator to the frozen embryo. It defies all common sense, so much so, that our intellects are not programmed to receive it. It resides in the will that we can accept this truth. It is by way of faith that it can reach us and then only if we want it. Incomprehensible as it may be, Jesus died for me and Jesus died for you.